French pianist and composer; born in Paris, Nov. 30, 1813; died there, March 29, 1888. On attaining his sixth year he was admitted to the Paris Conservatory of Music, and when but seven years old (1820) won the first prize for solfeggio; on this occasion he gave his first public performance on the violin. Alkan was the pupil, in pianoforte, of Pierre Zimmerman, laureate of the Institute of France in 1850, studied harmony under Victor Dourlen, and, in competition, was awarded the first prize for this subject in 1826. In 1828 he was appointed honorary professor at the Conservatory, which position he resigned in 1835. Besides achieving distinction in the technique of music he obtained the first prize for composition awarded by the Institute of France in 1831. Two years later he visited London, and on his return to France settled in Paris as a teacher of the pianoforte. Alkan devoted a part of his time to composition, and produced seventy-two works, comprising études, concertos, sonatas, caprices, transcriptions, and songs. Writing of his music, James D. Brown ("Biog. of Musicians," p. 14) says: "The works of this composer abound with technical difficulties. . . . His studies are especially extravagant in construction, and require close attention from even the best performers to obtain adequate interpretation." According to Grove ("Dict. of Music and Musicians," i. 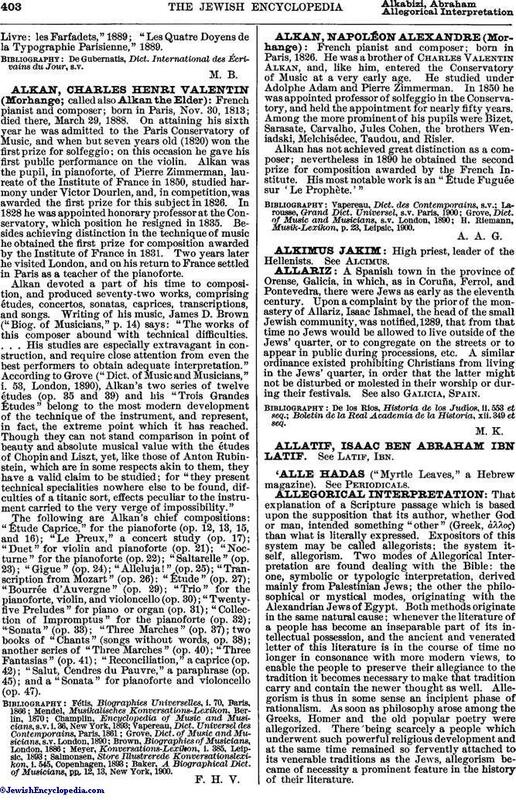 53, London, 1890), Alkan's two series of twelve études (op. 35 and 39) and his "Trois Grandes Études" belong to the most modern development of the technique of the instrument, and represent, in fact, the extreme point which it has reached. Though they can not stand comparison in point of beauty and absolute musical value with the études of Chopin and Liszt, yet, like those of Anton Rubinstein, which are in some respects akin to them, they have a valid claim to be studied; for "they present technical specialities nowhere else to be found, difculties of a titanic sort, effects peculiar to the instrument carried to the very verge of impossibility." The following are Alkan's chief compositions: "Étude Caprice," for the pianoforte (op. 12, 13, 15, and 16); "Le Preux," a concert study (op. 17); "Duet" for violin and pianoforte (op. 21); "Nocturne" for the pianoforte (op. 22); "Saltarelle" (op. 23); "Gigue" (op. 24); "Alleluja!" (op. 25); "Transcription from Mozart" (op. 26); "Étude" (op. 27); "Bourrée d'Auvergne" (op. 29); "Trio" for the pianoforte, violin, and violoncello (op. 30); "Twenty-five Preludes" for piano or organ (op. 31); "Collection of Impromptus" for the pianoforte (op. 32); "Sonata" (op. 33); "Three Marches" (op. 37); two books of "Chants" (songs without words, op. 38); another series of "Three Marches" (op. 40); "Three Fantasias" (op. 41); "Reconciliation," a caprice (op. 42); "Salut, Cendres du Pauvre," a paraphrase (op. 45); and a "Sonata" for pianoforte and violoncello (op. 47). Baker, A Biographical Dict. of Musicians, pp. 12, 13, New York, 1900.